"WE don't belong here? On the contrary, Herbert, I belong here completely and utterly. I'm home. It is YOU that do not belong here." Recently, I sat through the 2002, so-called "re-envisioning" of The Time Machine and was not very impressed. I was struck by how little respect is often paid to the great literary ideals of the past. Not content with sticking to the core story, filmmakers often make bewildering changes in remakes or novel-to-film interpretations. I guess it wouldn't bother me if there was some real spark of creativity involved. Thankfully, every now and then, some genuinely interesting takes on classic literature pop up, and Time After Time is one of the more memorable. It has a great cast, a clever screenplay, and a director who has the self-control to not only resist the use of gratuitous special effects, but restrains himself from falling back on the predictable, expected gags inherent in the ideas. The concept of Time After Time is that the novel, The Time Machine, wasn't actually fiction per se, but inspired by H.G. Wells' real-life experiences from building his own time machine. Not stopping there though, the clever screenplay dares to make the infamous serial killer Jack The Ripper someone that Wells knew personally. As the film begins, Wells (Malcolm McDowell) has invited his closest friends to his house to share the secret of his time machine development. No one takes him seriously, of course, and his emotional philosophies about visiting a Utopian future fall largely on deaf ears. Unfortunately, one of his friends is Dr. John Lesley Stevenson (David Warner) who, in secret, is the brutal murderer Jack The Ripper. When a trail of evidence leads Scotland Yard to Wells' front door, Stevenson is nowhere to be found. Wells realizes the worst: his friend-turned-psychopath has used his time machine to escape into the future, far from the arms of 1870s-era police. Without a special key, the machine will not stay in the future, so it immediately returns, after which Wells decides to bravely follow Stevenson's path to the year 1979 and try to convince him to return to his own time and face justice. Upon arrival in the 20th century, Wells discovers not only that he became (will become) a great author and philosopher, but that his utopia, sadly, does not exist. He befriends a clerk at the Bank of London named Amy (Mary Steenburgen) who then helps him track Stevenson. Once Stevenson learns Wells is onto him, however, he threatens Amy's life in order to extort the key to the time machine. While there is a subtle element of 'thriller' here, Time After Time actually functions more as a light romance film, in which Wells is enchanted by the utterly alien nature of Amy, very much a 20th-century woman. He finds himself a bit over his head trying to capture a clever maniac like Stevenson, but keeps forging ahead, all the while falling in love with Amy. Clever writing keeps the movie entertaining, primarily because, despite some well-placed moments of humor, director Nicholas Meyer does not overdo the time travel gimmick, but instead relies primarily on the chemistry of the lead actors, who all fit the story quite nicely. The romance angle between Wells and Amy functions very well, most likely because Malcolm McDowell and Mary Steenburgen actually become romantically involved on-set, leading to marriage and children. While I could have used a bit more confrontation between Wells and Jack The Ripper, there is still good, on-screen tension between the two actors, with David Warner providing his usual, restrained performance, letting on that he's indeed evil, but not much more than that. It would also be a temptation to make this a film about the Ripper, with lots of gore and horror sequences, but again, he is merely an element to the whole plot, not the focus. As a result, there's still the horror of The Ripper stalking the streets and murdering prostitutes, but with very little blood or violence shown, making him a wonderfully undefined threat. The elements combine to form an impressive movie that, while not perfect, is an intelligent mixture of social commentary and old-fashioned, adventurous storytelling. Image Transfer Review: The image is genuinely a pleasure to watch with not only proper aspect ratio restored, but a very impressive transfer that allows for sharp details and solid rendering of the moody cinematography. While the colors seem slightly faded, just a bit, the source print is very clean with hardly any serious defects or flaws visible. Even in the murky and fog-filled opening sequences, there is not an artifact to be spotted, and the rest of the film fares just as well, with no major digital issues. The truly fitting anamorphic image really looks great here, and I think fans will really love this disc. Audio Transfer Review: The Dolby 2.0 Surround audio is very theatrical, adding perfect effect to all the appropriate sequences and enhancing the wonderfully emotional musical score by legendary composer Miklos Rozsa. Surround effects are rather sparse, but then the majority of the film's major effects sequences are pretty much limited to the early reel. There is no distortion or any other problems with the track, which is good since so much of it is dialogue and tense silences. A French dub in mono is supplied, but should really only be a last resort for French speakers. Given that there's French subtitles, go that route instead. Extras Review: An extremely nice treat on this disc is the inclusion of a full-length commentary with Nicholas Meyer and Malcolm McDowell. While casual and friendly, the commentary is still tremendously informative and the kind of in-depth discussion of a film that makes for great supplements to any DVD. Meyer discusseshow the film evolved, how actors were eventually selected and other background trivia. McDowell talks a lot about his personal experiences on the film, his relationship with David Warner, and his marriage with Mary Steenburgen. Beyond the commentary is a short essay on the theme of time travel in history and literary work. The original trailer (in decent condition) is presented, along with the trailers for the 1960 and 2002 version of The Time Machine. The presentation is fairly standard Snapper-case style, and the cover artwork remains unchanged from previous releases. The 36 chapter stops offer wonderful coverage of the movie. 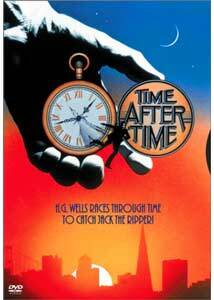 A good example of substance over style in a sci-fi movie, Time After Time is solid entertainment and an admirable attempt at something a step off the beaten path, especially for the late 1970s when films like Alien and Moonraker set such enormous standards for production and eye-candy.